The Gross State Product (GSP) measures everything that is bought and sold in the state. It is important because it is closely related to how much money we have to spend, new jobs likely to be created, and other aspects of the material well-being of our citizens. GSP, like Gross National Product, is often criticized because it is used as if it measured overall welfare, when in fact it only measures our material success. For example, if we have a high GSP but we are polluting our environment and spending a lot on environmental health, we might feel that our economic growth has made us less rather than more sustainable. This does not make GSP a useless measure; however, we should not expect it to tell us more than it really does. 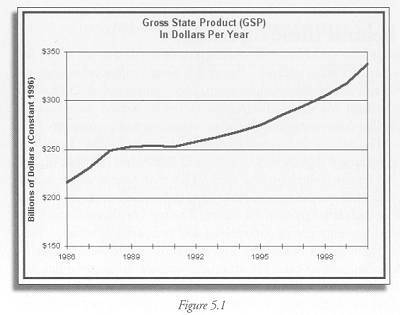 As Figure 5.1 shows, New Jersey’s GSP has increased sharply since the mid- 1980s, though it declined slightly in 2001. All else being equal, this longerterm trend is a good thing. However, all else is not equal. Increased GSP is sometimes associated with increased environmental harm, or conversion of natural resources to wealth at an unsustainable rate. Many additional details can help us understand the significance of these figures. It is useful to know which sectors of the economy have generated the economic growth, since different sectors generate different amounts of employment and pollution. Most of the state’s growth over the past decade has been in services, finance, insurance, and real estate. (1) With the exception of real estate, these are sectors that cause little direct harm to the environment, because their primary input is labor and they do not directly cause pollution. In contrast manufacturing, which can be highly polluting, has declined over the past decade. If we are still purchasing as many manufactured goods as in the past, then we may simply have exported the pollution associated with them to the states or countries from which we import the goods. A great deal of additional information is needed to determine exactly how a given economic growth pattern affects sustainability. This will depend on how the growth occurs, what we are consuming, and many other factors not directly related to the structure of the economy. Moreover, although in fact it measures production, GSP – like Gross National Product – is often used as a proxy for welfare. Development of actual measures of welfare is difficult, because they are necessarily quite subjective. More work in this area is needed if we are to have indicators that actually tell us how well off we are. In addition, a significant portion at the state’s GSP is attributable to the real estate sector. The environmental impacts of growth in the real estate sector are complex. New Jersey’s sprawling land use pattern has significant impacts on transportation and retention of open space. New developments can be designed to impose less harm on the environment and to encourage more sustainable transportation patterns. The impacts of growth in the real estate sector on sustainability as a whole are very complex questions requiring additional analysis.